Today, I am 8 months old! I can’t believe how fast the time is going – it seems like I am getting bigger every day. Mommy feels like she is going to turn around, and instead of her baby, she will see a big boy at any moment! As of my last doctor’s visit, I weigh about 18 pounds and am 26 inches tall. I have SIX teeth: 2 on top and 4 on the bottom, none of them aligned with any other. Mommy sees orthodontia in my future. I can crawl – sort of. I can *definitely* get where I’m going – and I no longer squish my face into the carpet as I push with my legs – but I don’t really use my arms and legs at the same time. I sort of pull myself along with my arms, like an army man. You’d be surprised how fast I can go, though, especially when I’m trying to get to something or someone (Henry). I can pull myself up into standing. I expect to start running any day now. I am eating more and more solid foods. I *love* puffs and yogurt melts, but my absolute favorite is pickles. 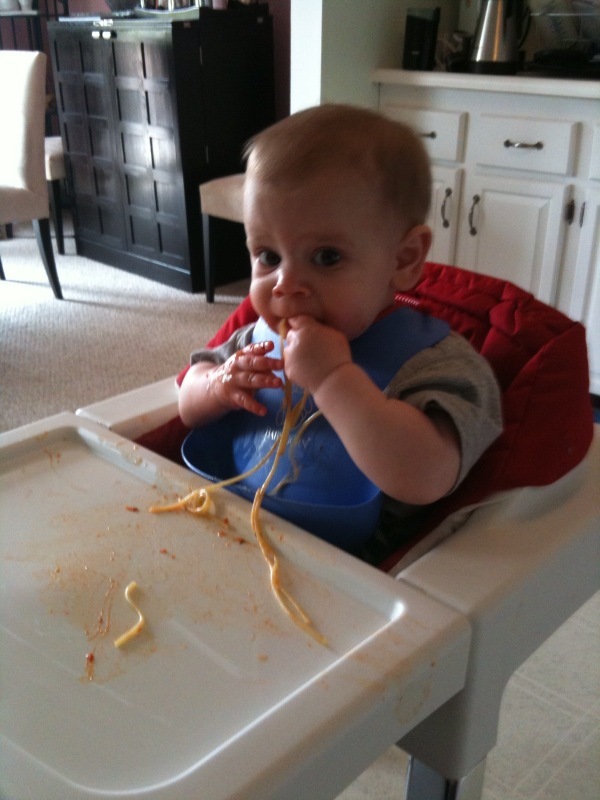 Spaghetti is a little tricky. I am doing more babbling, but I’m not really very chatty. I like to say “mumumumum” and blow raspberries. I know I haven’t posted a video in a long time, so here’s a new one – I started out crawling down the hall to Mommy, and then you see Henry zooming past and I turn around to follow him back the way I came. This happens about 735 times a day. Henry finds it endlessly amusing to make me chase him – we’ll see who’s laughing in a few months! Don’t forget to enter this week’s giveaway – you could win a personalized storybook! Oh my god. All babies should crawl like this. It'd be 100% more entertaining!!! !